Serving Aqua Mane, Mango Dip, and Knot Gelatin Day 4 Hair Realness... Oh yeah, and I'm engaged now! Lol. I don't think there's a single person on the planet who doesn't like summer. The tanning, traveling, pool parties and BBQs make the excitement of the season hard to resist. But between sea salt, chlorinated pools, and dry heat (especially for my desert dwelling west coast folks), summer can really do a number on your hair. 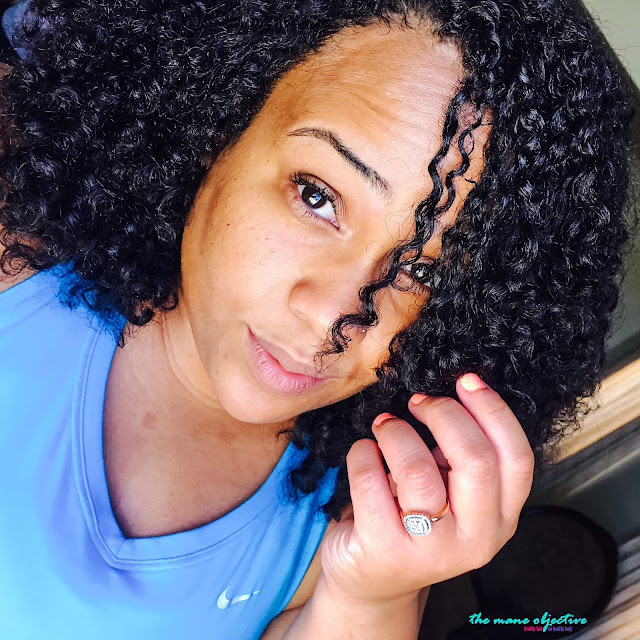 Luckily, with these 8 steps, you'll be able to keep your kinks, coils, and curls super moisturized and poppin' all season long. To bring you guys these tips, I enlisted the help of Soultanicals. If you're a long time reader of the blog, then you know me and Soultanicals go wayyyyyyyy back. Like back to my transitioning days back. One of my favorite things about Soultanicals is that their products always deliver. If the bottle says it's gonna detangle, it detangles. If the deep conditioner is gonnna moisturize and strengthen, guess what happens? Moisture and strength. The amazing fragrances, botanical blends, and vegan ingredients are just bonuses. 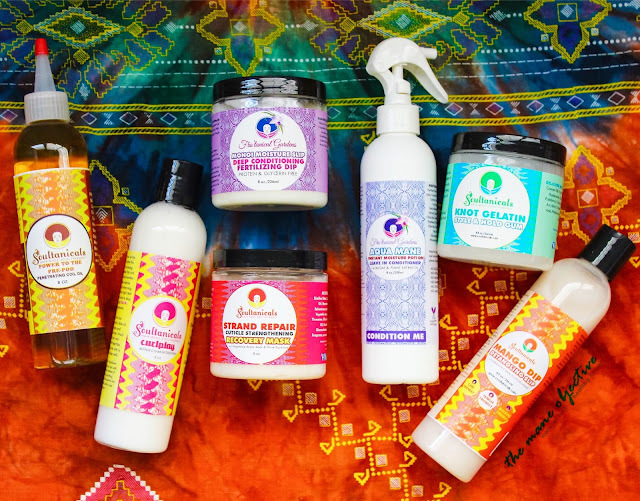 All Soultanicals products are silicone, paraben, and sulfate free. They're also Curly Girl friendly. For #summersixteen I'm holding tight to these Soultanicals products to keep my hair strong, nourished, moisturized and of course - curls poppin'! For each step, I'll share the corresponding product used, most potent ingredients (top 5-6 after water), whether it's protein free, and tips for use. Organic Extra Virgin Olive Oil: Oil extracted from the olive fruit, which is rich in high levels of mono-unsaturated fatty acids and vitamin E. Vitamin E is an antioxidant, which is good for hair growth. Both mono-unsaturated fatty acids and vitamin E are good for moisturizing, protecting and nourishing hair. Olive oil makes hair grow stronger and its emollient properties prevent hair loss. Virgin Coconut Oil: Oil high in saturated fats (which is why when cold, it is solid). One of the few known oils to penetrate the hair shaft and truly moisturize hair. Coconut oil helps to moisturize, seal, and prevent breakage. Organic Palm Kernel Oil: Oil rich in Omega-9 to soften the hair, seal in moisture, and support cuticle health. Amla Extract: Hair conditioning herb that provides scalp-penetrating nourishment. Strengthens hair at the root, promoting stronger, healthier new growth. Can help slow or prevent hair loss, shedding, and breakage. Brahmi Extract: Herb used to strengthen and thicken hair, as well as soothe itchy scalp. I use Power to the Pre-Poo three ways. First, I use it as a pre-poo treatment - applying the oil to my scalp and throughout the length of my hair. I let the oil sit anywhere from 1 hour to overnight, so that my hair and scalp get all the extra nourishing benefits. Because Power to the Pre-Poo is not a super heavy oil, I'm also able to use it to seal in moisture during styling, and to calm the itchies on my scalp between wash days. Extra Virgin Olive Oil: Oil extracted from the olive fruit, which is rich in high levels of mono-unsaturated fatty acids and vitamin E. Vitamin E is an antioxidant, which is good for hair growth. Both mono-unsaturated fatty acids and vitamin E are good for moisturizing, protecting and nourishing hair. Olive oil makes hair grow stronger and its emollient properties prevent hair loss. Macadamia Nut Oil: Omega rich oil that helps soften, nourish, seal moisture, and support cuticle health and repair. Behentrominium Methosulfate: Gentle surfactant made from non-GMO rapeseed (canola oil), and is one of the mildest detangling ingredients out there. It doesn't cause buildup or irritation to the scalp. Vegetable Amino Acids: Building blocks of protein that help repair the cuticle layer of the hair. Ahh, this goes back to the Mielle Organics debate. While there are no hydrolized proteins in Strand Repair, it is full of amino acids. Proteins are made up of chains of amino acids. The cuticle layer of the hair (we've talked before about how the cuticles lay like shingles on a roof) contain the highest concentration of amino acids. The cuticles of the hair are responsible for everything from porosity and strength, to moisture retention and how the hair behaves (or curls). Glutamic acid, proline, valine, and cystine are very prevalent on the outer layers of the cuticle, and epicuticle, helping to keep the cuticle layer healthy and strong. In deep conditioners like Strand Repair, amino acids help damaged hair restore normal porosity by improving the sealing ability of the cuticle layer. Aminos also strengthen and moisturize the hair, as they attract water. So to wrap this thing up with a neat little bow, the deep conditioner contains elements of proteins that help strengthen, restore the cuticle layer, balance porosity, and stimulate growth. Is it protein free? Well again - that's for you to decide! My hair loves protein, but recently I've been all about the aminos. With Strand Repair, I'm able to really zero in on the areas of my hair that need TLC - the bottom third of my curls are what's left of the hard hitting hair color that did a number on my strands. At this stage in the game, the health of the cuticle layer determines whether or not my curls will be loosey goosey and limp, or super supple and springy. To keep my curls popping, I deep treat with Strand Repair biweekly - with steam. Because I don't have a steamer yet ($$$), I do a bootsie steam treatment by wetting a hand towel, microwaving it for 2 minutes, and covering my hair with it. I tie a Target bag over the towel and bam! 10-15 minutes of steam action for free.99. I thought I recorded this in the video, but apparently I recorded myself walking through the house holding the camera - and not the parts of the process that mattered. Go figure. Water infused with Hibiscus Flower Extract, Ginseng Root Extract, and Yerba Mate Leaf Extract: Herbal infusion that promotes growth, strengthens the follicles, and staves off hair loss by stimulating blood circulation. Monoi Oil: Floral oil made by steeping Tahitian gardenia flowers in coconut oil. In addition to smelling amazing, monoi oil helps soften the hair, add shine, and lock in moisture. On the weeks I don't use Strand Repair, Monoi Moisture Slip is my go to. Because of the botanical infusions that revitalize, promote growth, and strengthen the follicles, I always apply Monoi Moisture Slip from the roots on down. I follow the same bootsie steam treatment, and the results are amazing. 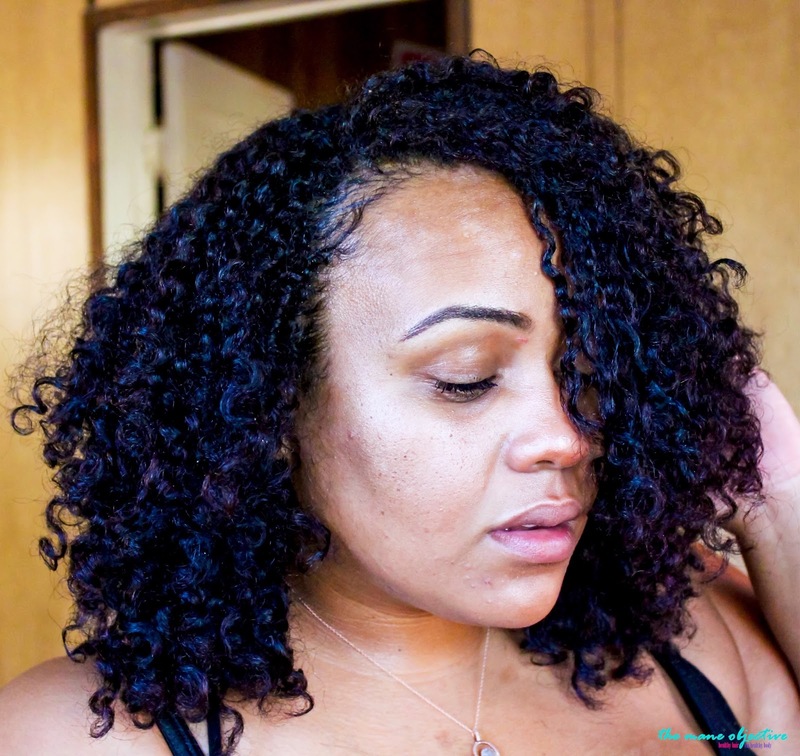 Super soft and moisturized curls that pop! Not to mention, the slip in this stuff is pretty gosh darn epic. This step is totally dependent on your preferences and wash day regimen. I personally co-wash 3 weeks out of the month, and then shampoo the 4th week to clarify, remove buildup, and start with a clean slate. Need help picking a cleanser? Click here for my absolute faves. Sodium Stearoyl Lactylate: Non-toxic, biodegradable food-grade additive used to stabilize and improve the mix tolerance of processed foods and products. If your hair is perpetually dry, or you live in a drier climate - I highly recommend the dual leave-in conditioner method. I swear by using two leave-ins, because the traditional LOC and LCO methods were not doing it for my curls. Between stringy, greasy realness and white clumpy gobs, I couldn't hang. But ever since I've been using two leave-ins, my curls have been super happy. With Aqua Mane as my primer, I'm able to boost hydration while pH balancing my curls and prepping them for styling. As you saw in the video, my hair soaked Aqua Mane right up! It packs a moisturizing punch without weighing my hair down or making it greasy - but at the same time doesn't interfere with other products I'm layering into my hair. Plus, Aqua Mane makes an amazing refresher spray too! Botanical Water Infused with Nettle, Horsetail, Coltsfoot, Comfrey, Slippery Elm, Blue Malva, and Chamomile: Rich in vitamins A, C, K, as well as vitamins, minerals, and chlorophyll to soothe and nourish the scalp. Encourages hair growth by improving circulation, reducing inflammation, strengthening the follicles, and reducing shedding. Cetearyl & Sorbitol Olivate: 100% Ecocert and organic PEG-free emulsifyer (mixing agent) derived from olive oil. Reduces water loss, is highly moisturizing, and biomimics the skin's natural oil production. Flaxseed Gel: Made by boiling flaxseeds in water to create a thick, mucous-like gel. Flaxseeds are omega-3 rich and benefit the hair by improving elasticity, smoothing the cuticle, nourishing hair follicles, stimulating growth, easing dry, flaky scalp, and increasing hair strength. Y'all. Y'ALL. Listen. I've loved Mango Dip Detangling Slip since forever. Well, Since 2013 - and let's face it, in product junkie years, that's an eternity. Mango Dip is leave-in and detangling bae. It made the Christina's Choice cut in 2015. But enough about my mango-fueled obsession. To pull off the dual leave-in conditioner method, I've found that combining one spray with one super creamy leave-in works best - and Aqua Mane and Mango Dip are a match made in natural heaven! Mango Dip is super moisturizing, has tons of slip, and perfectly preps my curls for wash and go styling. It truly is an epic, epic leave-in. Did I mention how epic it is?! On another note, I typically apply my leave-ins inside the shower, for maximum hydration and to minimize frizz. But to show you guys the products in action, I left one section of hair naked. Yes, I sacrificed a quadrant of curls for you guys, lol! As mentioned previously, Power to the Pre-Poo makes an excellent sealing oils. I take a few drops and work it through my hair from root to ends. That's it and that's all! Fractionated Coconut Oil: Lightweight, nutrient rich, and fast absorbing. All the benefits of coconut oil without the heaviness and solidifying in colder temperatures. Algae Extract: Nourishes the hair and scalp - is believed to be able to accelerate hair growth and thicken hair. Sodium Hyaluronate: Salt of hyaluronic acid that penetrates and draws water into the hair and skin - promoting suppleness, shine, and hydration. Olive Wax: Thickener and stability enhancer derived from olive oil. Yes! 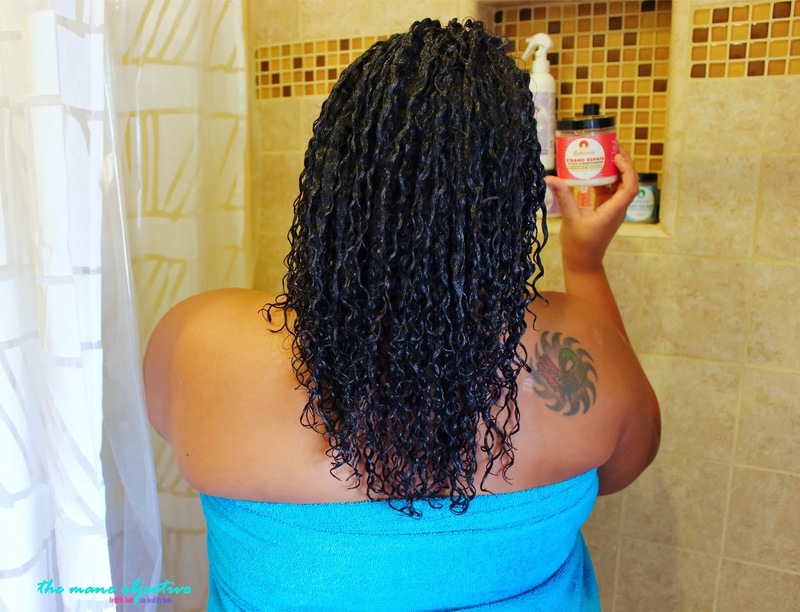 A protein-free gel for the wash & go ladies! Okay, so here's my absolute most favoritest step, and the secret to my wash and go realness. I've got the Rake & Shake Method down to a science. It takes a lot less time than shingling, and delivers equally epic results that last for days. Rather than explain away, check out the video for the detailed breakdown on how I use Knot Gelatin Style & Hold Gum to rake and shake my curls into super hydrated fabulouslessness. If you don't want to watch the whole vid, skip to the 5:22 mark. Knot Gelatin, as I mentioned in the video, is a close cousin of Curl Blaze Hair Glaze - but a little thicker and with less of a bite. Knot Gelatin does create a gel cast, but by day 2 that bad boy is gone. Like *NSYNC gone (by the way, that was the JAM back in the day #early2000sboybandrealness). Just make sure you apply enough at the roots, and with all wash and go styles - work on soaking wet hair. If your hair starts drying out as you work through the small sections, rehydrate them with water, or a little Aqua Mane. Unfortunately, I think Knot Gelatin was a limited release. But don't worry - Soultanicals stays with the curly dopeness. Curl Blaze Hair Glaze, Afro Gel-lato, and Kurl Krush are all amazing, protein-free altenratives! And I've used every, single last one of them. Step 8: Air Dry and Be Cute! Nuff said. I don't diffuse in the summer, or at all really (unless I'm hella desperate), because no matter what way you slice it, the blow dryer robs hair of precious moisture. Yes, there's less volume on day 1, but by day 2-5 you'll realize packing the diffuser away was for the best. Now go be cute, with yo' cute #summersixteen wash & go self! Just try to keep your hands out of your hair until it's 100% dry! Hi, my daughter has beautiful curls but as she's gotten older they always just look dry, frizzy and puffy. I think she should be able to wear her curls naturally but I think we need to find the right products. So, thank you for providing some advice, After watching your video, can you clarify a question for me. While watching, I thought you used 6 products, one after another except the Pre Poo. Is that correct? Do I let her hair dry in between products or is it like layering them one after the other?